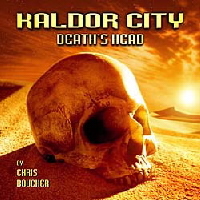 Following on from Kaldor City: Occam's Razor, Death's Head is written by Chris Boucher, the man who first created Kaldor City and its inhabitants in the Doctor Who story "The Robots of Death", and who developed the character of Carnell in Blake's 7: Weapon. 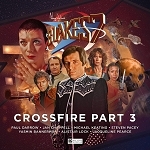 Produced once again by Alan Stevens with sound design by Alistair Lock of Big Finish productions, the story boasts an accomplished cast headed by Paul Darrow, Scott Fredericks and Russell Hunter and including Peter Miles, Trevor Cooper, Peter Tuddenham, Brian Croucher, Tracy Russell and Nicholas Briggs. In Death's Head, Chris Boucher takes the series' format in a new direction as he weaves a masterful tale of Chandleresque suspense. The discovery of shady dealings at a desert research station leads Operations Supervisor Rull (Trevor Cooper) deep into a twisted maze of ambition, carnal desire, injustice and darkly humourous assassination attempts. At the hub of this web of intrigue would seem to be the enigmatic psychostrategist Carnell (Scott Fredericks)-but who is he working for? The well-crafted plot will keep even the most intelligent listener guessing until the very end.